Domain name really important in blogging, if you are not having one then buy one for your blog it's cheap even than value of it, but in this article I am going to share you one interesting and an important part of blogging because domain name also important to get good rank on search engines like Google, Yahoo, Bing or any other search engines. This is also important, if your blog contents helpful for worldwide then I will suggest you to choose domain(.com or .org or .net), the reason is simple because these are most famous international domain names, because search engines show results worldwide, if your blog having one of these domain names, so probably of getting free traffic is more from worldwide. See choosing domain tell how much you are professional about blogging, if you want to make brand then this is must, one simple lesson I have learned in blogging, if you want to get good output(money) from business then you have to some input(money) in your business. Finally you are going to know the best part of blogging for search engine optimization point of view for your blog, hopefully you are curious to know the hidden facts about selecting domain name. Actually this is also known by domain name structure, if your domain name structure is related to your contents you are providing in your blog then that is one of the best thing to get your blog post on the top of the search engine results. Let me help you more to get this point properly, actually there are most four important factors to get your blog posts on the top of the search engines. But here I am talking about most important part of the URL structure that is main URL of the blog, I mean think about this, if URL structure is helpful to get your blog posts on the top of the search engine results then the main URL of the blog will be definitely helpful to get your blog posts on the top, right! Here is the example for you, if I have given name of my blog www.somethingblogging.com then probably I could get more traffic from search engines than now, but I am not going to change it, because it's a unique name easy to remember too! But I will suggest you, if you are planning to buy a new domain name then use the most important keywords of your blog in your blog URL and see the ranking in the search engines for each post. Important Words- Here in above domain name means URL of my blog is even not that much perfect, can you guess why is this so. The reason is I have used HowTo, actually search engine Google does not bold these words, well I am going to discuss more in the next heading. After blogging more than 4 years I have learn as well as earn lot of money, I have also added few payment proofs here, but most of my income come from direct one to one consulting. Okay, lets come to the point, here I am going to share with you the tip, which probably no one is talking in the whole internet world, at least I did not heard. Here is the main points to notice while selecting domain name, don't use keywords like- what, how, when, where. These keywords are not going to help you at all, this is my real experience, here is the proof of it also, I am going search the term- "how google adsense alternatives in India", here is the screen shot of it also. Here in the screen shot you can see, search engine Google did not bold the keyword "how", then what's the use of using these keywords in the domain name. I hope this is going to help you! The reason is quite simple, if you are really curious about blogging and want to earn money as fast as possible then probably you are going to make mistake. Because you will take all decision earlier, here people make mistakes, see before taking decision take time and then take decision because it may effect your career. One of the best way to find right path, consult with person those are already succeed in the same field then can give you good suggestions. Hey, this is also possible that you still required personal guidance to buy domain name and my personal guidance then don't worry I can help you, just contact me on Facebook. 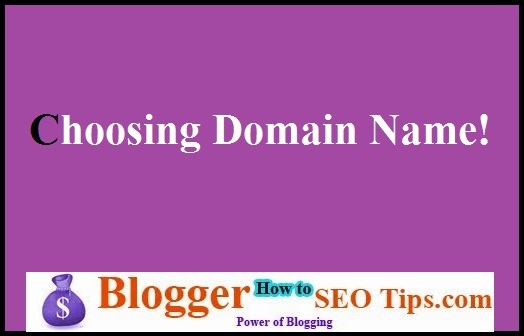 See domain name is important but it is also important choosing a domain name, remember every time before buying a domain name, your domain name must not too much lengthy, about 8 to 16 words is good, because it is easy to remember and give an interesting domain name for your blog that's why people will see once they will remember the domain name for forever! What do you think about choosing domain name for blog? This blog always post great articles for SEO related. I like yours all articles very much. This also helps me to rank my website. Actually I am newbie to SEO field. can we earn money buy not buying domain. if i make a blog in blogger.com then how can earn money from that? I am 16 year old student can i make money from both blogging and youtube.